16. What's the best price I can get on a car? With auto rebates getting rarer and prices starting to rise, you need all the negotiating ammo you can get. It's not hard to find a site that divulges the dealer invoice price for various models. But TrueCar tells you something that's even more helpful: exactly what other buyers in your area recently paid for the model you want. With that info -- gathered from finance companies, insurers, dealers, and other sources -- you can make short work of negotiating. 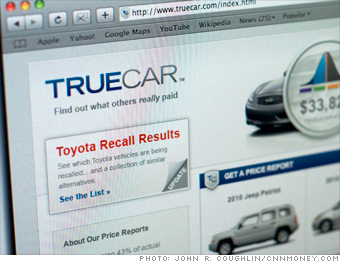 TrueCar VP Jesse Toprak says the average user strikes a deal in 15 minutes or less. Coolest feature: You'll get a nifty graphic combining the breakdown of the dealer's actual costs, the average price people are paying, and what's considered a great vs. merely a good deal for that model. Try this too: The True Market Value tool at Edmunds.com offers a slightly different take: Analysts adjust the data to reflect market conditions. It doesn't give as much info as TrueCar does, however. NEXT: 17. Where can I get a deal on electronics?